During an exploration survey in the tribal belts of the Eastern Ghats and northern plateau zone of Odisha, I came across a group of women collecting leaves of the thalkudi plant from wild habitats. When I enquired, I was told they use the leaves for supplementing food items. But the story of thalkudi is a much extensive one. Thalkudi (Centella asiatica), the Indian pennywort, is a stoloniferous per¬ennial herb, commonly found as a weed in sandy or clayey soils of marshy waste places, ditches, river banks and low wet areas. It belongs to the family Apiaceae and is native to countries in Asia, including India, China and Malaysia. The plant is character¬ised by creeping green and reddish green sto¬lons; its leaves are roughly kidney-shaped; its flowers are pink or white in fascicled umbels —flower stalks arise from a common point. It has different names–thalkudi in Odia, saraswataku in Telugu, vallarai in Tamil, vondelaga in Kannada, kudangal in Malayalam, tholkuri in Bengali, manimu¬ni in Assamese, peruk in Manipuri, brah¬mi in Marathi, brahmibooti in Hindi, man¬dookaparni in Sanskrit and gotu kala in Sinhala. The tribal and rural people of Odisha use the leaves for various food items such as sag, cur¬ry, chutney, cake, sherbet, herbal tea, and even as an additive to liquor. The tribal groups of Khadia and Mankirdia living in the Similipal Biosphere Reserve call this plant benga sag. The leaves including petiole are chopped and added with vegetables like pumpkin, brinjal, tomato and garlic and cooked as sag. It is also consumed as pitha or cheka bhaja—round¬ed flat cakes prepared on a pan by frying the shredded leaves with rice/gram flour and salt. However, the Dongria Kondh, a tribe in Niyamgiri hills in Rayagada district, Odisha, call the plant dhuna kucha and cook the leaves with mustard, chilly and prawn, and consume it as a curry. This dish is also served in social functions. Rama Wadaka and Peju Padraka residents of Khajuri village reveal that fresh leaves of dhuna kucha are added in sadapa mada, locally prepared palm liquor, to en¬hance its taste and flavour. The Kolha and Santhals of Mayurbhanj district call it chakedopaah and prepare a chut¬ney with the leaves, which is a common dish among rural and tribal inhabitants. They con¬sume this chutney along with their morning meal of pakhala (watered rice) before going for work (see recipe: ‘Thalkudi chutney’). Shri Ram Janka and Khudiram Hembram, tra¬ditional medical practitioners of the Kolha tribe, treat patients by prescribing two to three raw leaves per day, which helps en¬hance memory and check tremor among el¬derly patients. Thalkudi is also used to prepare herb¬al tea–a cup of boiled lemon tea is poured over fresh or dried leaves allowing it to brew a few minutes. 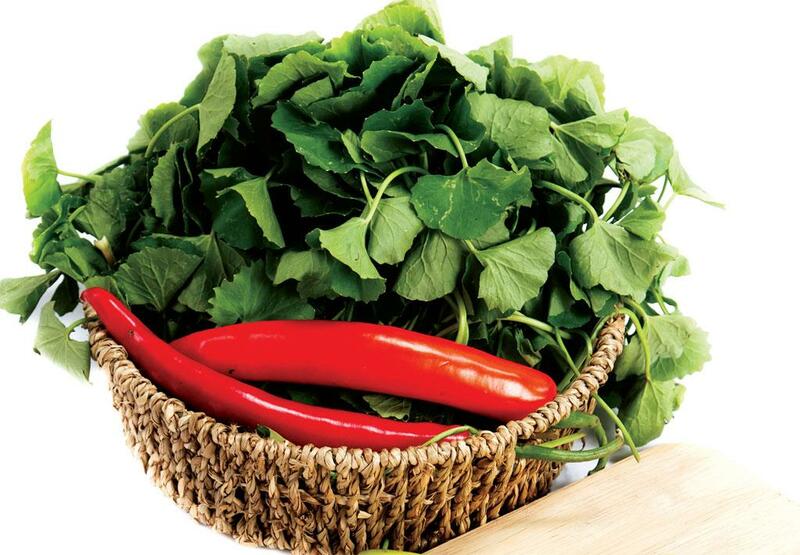 The leaves of tulsi (Ocimum sanctum) can be blended along with thalkudi to enhance the flavour. The herbal tea is con-sidered to have antioxidant properties, states V Naithani, in a paper published in Food Research International in 2006. The herbal thalkudi sherbet is prepared by grinding the leaves and adding sugar or misiri (sugar candy) or salt along with small pieces of lemon and served as a summer drink. It has been proved that appreciable amount of phytochemicals such as asiatico¬side, madecassoside and polyphenol com¬pounds present in the leaves are a good source of antioxidants, states a research by S Kormin for Malaysia University in 2005. Fresh juice is better than the processed juice, as it contains higher total concentration of volatile com-pounds, says a study in 2005 by P Wongthum in Food Chemistry, a journal. Thalkudi is used as a leafy green in Sri Lankan cuisine too. 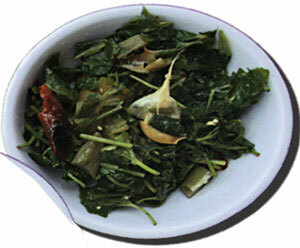 In Vietnam and Thailand, the leaf is used for salads or to prepare a drink. In Bangladesh, the leaves are mashed and eaten with rice. In ancient times, thalkudi was re¬garded as the most spiritual of all herbs and was used by yogis to improve meditation. It is said to help develop the ‘crown chakra’, the energy centre on the top of the head, as well as balance the right and left hemispheres of the brain, as the leaf resembles. Thalkudi is highly val¬ued in the indigenous system of medicine. Asiaticoside, a glycoside, isolated from this plant, is useful in the treatment of leprosy and tuberculosis, says the Wealth of India, a document by the Council of Scientific and Industrial Research. The plant extracts have also been used in Chinese medicine as a brain tonic and to combat stress and depression. It also energis¬es mental powers, and strengthens the cen¬tral nervous system. The micronutrients in the extract prevent brain ageing and are ef¬fective for improvinng concentration power and revitalising the brain, according to stud¬ies by R H Singh (Biogerontology, 2008) and by M Subathra (Experimental Gerontology, 2005). Pharmacological and clinical trials also reveal the leaves can change the behav¬ior of mentally-challenged children. A cold poultice of the fresh herb is used externally in rheumatism, elephantiasis and hydrocele. The leaf juice with palm jaggery is given to women as a tonic after child¬birth. The leaf juice is rubbed on the fore¬head to cure severe headache. 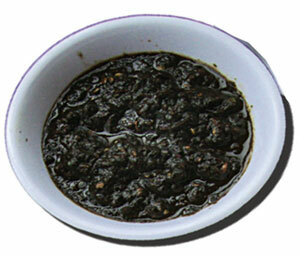 The leaf syrup with ginger and black pepper is used to treat cough. As a tonic, it is used to treat bronchi¬tis, asthma, gastric catarrh, leucorrhea, kid¬ney troubles and dropsy. Though no negative effects have been re¬ported, it may cause miscarriage if it is con¬sumed during pregnancy. It may raise cho¬lesterol and blood sugar levels, so it should be avoided by diabetics and those with high cholesterol. Fry a pinch of asafoetida in a pan. Add fenugreek, fennel, red chilies and curry leaves till it turns reddish in colour. Remove the pan from the flame. Add leaves of thalkudi, tamarind, sugar and salt and grind them well. Half a spoon of warm water can be added, if required. Serve the chutney with meals. Fry garlic cloves till they turn reddish. Add mustard, chili and tomato and keep stirring. Add leaves of thalkudi, pumpkin, brinjal and salt. Boil on a slow flame covered with a lid till the contents soften. Serve with rice or chappati.